"I write this after a night of very little sleep. So many unanswered questions made it difficult to settle. Once I had fallen asleep my dreams took me back to the night Alice died in my room and I lived again the blue flames that took my cousin away before I woke covered in sweat and terrified." London! The greatest city in the world, home to four million people. A thriving hub of trade and industry, the first city of a fading empire. The final resting place for treasures from across the globe, a labyrinth of imposing white marble streets and a warren of darker alleyways all sat atop millennia of history. 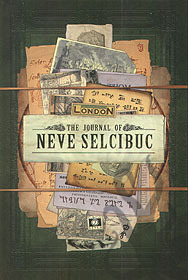 As part of Cubicle 7's Cthulhu Britannica line The Journal of Neve Selcibuc is both a fascinating standalone work of Call of Cthulhu fiction as well as a deluxe, in-world artefact for use with the London-based The Curse of Nineveh campaign.